Peterborough Panthers have only two of their own riders available for their big play-off date tomorrow (October 21). The city team travel to Rye House to take on Lakeside Hammers in a twice-postponed SGB Championship play-offs semi-final, second leg (6pm). 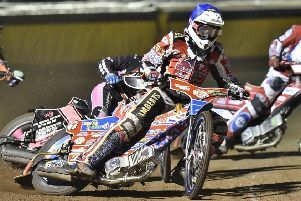 Skipper Simon Lambert and Danish second-string Emil Grondal will be the only regular Panthers men in a side depleted by injuries in the closing stages of the campaign. And the city club were hit by another casualty earlier today (October 20) when Danish veteran Ulrich Ostergaard was ruled out by an illness which has laid him low during the past week. Owner Ged Rathbone said: “Ulrich has been poorly all week and has been to the doctors to have blood tests to try to get to the bottom of what’s wrong with him. “We left things as late as possible to give him every chance of being able to ride, but we had put Nico on stand-by and he will now come in to the team. Ipswich man Nico Covatti has been called in as a guest for Ostergaard with fellow borrowed riders Thomas Jorgensen, Tero Aarnio and Carl Wilkinson also featuring in a makeshift side. Panthers trail 46-44 after being beaten by Lakeside in the first leg at the East of England Arena earlier this month. PANTHERS: Thomas Jorgensen (guest), Emil Grondal, Rider replacement for Bradley Wilson-Dean, Tero Aarnio (guest), Nico Covatti (guest), Carl Wilkinson (guest), Simon Lambert.